With so many rescue and donation efforts taking place in the wake of Hurricane Harvey, animals lovers are stepping up again to offer support after Hurricane Irma smashed through island nations and much of Florida. Below is a list of rescues and organizations who are in extreme need of supplies and financial help to support rescue, relief and reunions, and a list of websites and apps folks can use to find beloved lost pets. We will continue to update this list as more information becomes available. To offer a temporary foster home for families as they rebuild, visit fosterahurricanepet.org. The organization is currently in the midst of building a hurricane-proof shelter, which is expected to open in March 2018, but perhaps later now with hurricane damage cleanup. The scene inside the Humane Society of Greater Miami. Photography courtesy the Humane Society of Greater Miami. The Humane Society of Greater Miami’s Soffer and Fine Adoption Center has suffered an estimated $500,000 in damages and downtime as a result of Irma — including roof leaks, a broken air conditioner in hot and humid conditions, uprooted trees in its pet cemetery and damage to its medical clinic. While it is still able to triage care for over 400 animals who survived the storm, it’s in need of financial support to make major repairs, take in more lost/found animals, provide medical care and provide generators and air conditioning to keep all cats and dogs alive. The HSUS evacuated 450 animals ahead of the storm from the Ft. Lauderdale area, transported dogs and cats from Tampa, and has flights planned with its partners Wings of Rescue and GreaterGood.org to fly animals from Clay County in the north, Alachua County in the central part of the state and Collier County in the south. Additionally, its global organization is assisting animal rescue efforts in the British Virgin Islands. To help, text LOVE to 20222 to donate $10 to the Humane Society’s disaster relief fund, or make a donation here. This unique team provides professional technical animal rescue and recovery to communities affected by catastrophic disasters throughout North America. Its volunteers and staff, who are highly trained in dangerous rescues and animal handling, respond upon an official request for assistance from the local emergency managers and officials. As a non-profit, it depends upon public support to continue training, education and maintain its ability to deploy in times of need. You can support this vital rescue group by donating here. Based in Jacksonville, Florida, this rescue has partnered with Best Friends Animal Society to take in as many lost and found felines and canines as possible. It has set up a logistics and distribution center to support animal welfare organizations across the hard-hit state and are in need of critical supplies to support injured, lost and rescued animals. Here is the group’s Amazon wishlist. Efforts can be supported by donating here. This shelter has taken in over 400 animals in the wake of Irma, and is expecting a few hundred more in the coming days. Its biggest needs are monetary donations to keep operations running, and foster homes for the incoming pets as it prepares them for adoption. To apply as a foster in the Atlanta area, visit here. 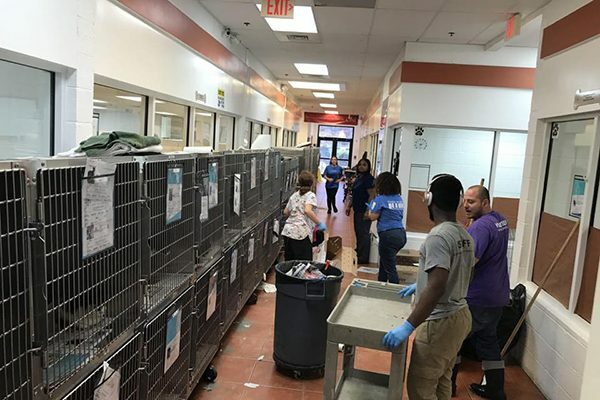 Inside the Inside the Humane Society for Greater Savannah, Georgia after Hurricane Irma. Photography courtesy Humane Society for Greater Savannah. All cats and dogs from this shelter were transported further inland to Atlanta and into foster homes until the hurricane passed. 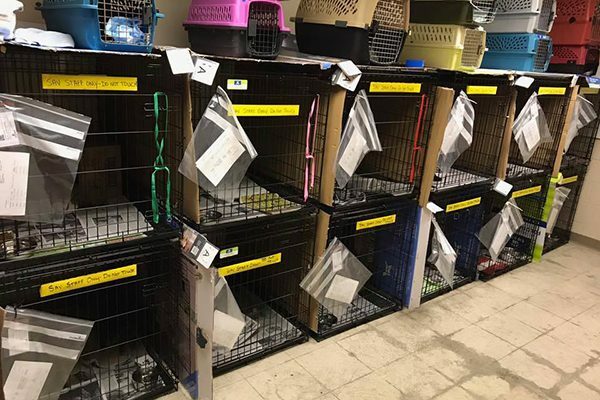 Over 100 fosters are now being returned to the shelter, where there will be plenty of hungry mouths to feed and tend to until they are adopted. On September 9, in anticipation of Hurricane Irma’s arrival in Florida, The Anti-Cruelty Society teamed up with the ASPCA to take in animals that were in the shelters in Lee County, Florida. The Anti-Cruelty Society took in 49 cats and dogs on ahead of the hurricane (and nearly 200 from other southern states) and is actively recruiting dog foster homes. People interested in fostering can fill out a form at http://bit.ly/Irma_ACS. To help with Hurricane Irma and Harvey relief efforts, donate here. Several island nations and commonwealths in the Caribbean were hit hard. The devastation and damage is still being assessed, and slowly reported out as most forms of communication are down. While most animal shelters are reporting safe cats and dogs via Facebook posts, most are without critical supplies, reliable communications and power, and in need of facility repairs. Here are a few island humane societies and shelters in need of financial support and supplies. Vieques Humane Society and Animal Rescue, Inc.
Thumbnail: Photography courtesy Humane Society of the United States. Tell us: How are you helping Hurricane Irma recovery efforts? What other animal welfare organizations should we add to this list? The post How to Help Animals Affected by Hurricane Irma appeared first on Dogster.